Steak and gravy is a hearty meal your family will love. 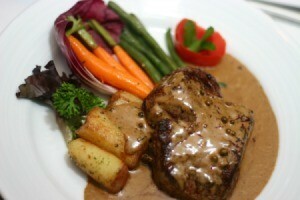 This page contains steak and gravy recipes. This is very good and easy to make. Cut steak into serving-size pieces and season with salt and pepper. Lightly brown steak in a small amount of oil. Transfer steak to a 9x13-inch baking pan. Sprinkle onion soup mix over steak. In a saucepan, combine soup and 3/4 cup water and heat just enough to mix well. Pour over steak pieces. Cover and bake 1 hour. Check to see if more water is needed. Continue to bake another 30 minutes. Cut steak into 5 or 6 serving size pieces, remove fat and bone. Place in crockpot. Add remaining ingredients. Cover and cook on low setting 8 hours or until meat is tender. The gravy is good with potatoes or rice. Serves 5-6. Yummy gravy with this recipe. Mix flour, salt and pepper. Rub or pound flour mixture well into both sides of meat. Brown meat in oil or shortening. Blend beef broth, water, barbecue sauce and chili powder. Pour over meat, cover and simmer 1 hour. Add green pepper and olives. Simmer 1 - 1 1/2 hours longer or until tender. Skim fat from gravy and thicken, if desired. Easy recipe and very hearty! One of my favorites! Love the gravy! Stir liquids together in crockpot. Add meat. Cook on low while you are at work. When you return home, you need only make a batch of garlic instant potatoes or noodles and heat a can of green beans to make a good meal.